Several well known security camera manufacturers have recently introduced models that are made to work outdoors. An excellent example is the Arlo Smart Home Security Camera. Like most outdoor cameras, these are waterproof and made to withstand typical weather elements such as snow, ice and rain. Today we discuss outdoor home security camera mounts. Outdoor home security camera mounts are not all created equal. I have seen some inexpensive imports made of plastic that aren’t likely to hold up to a decent wind storm. Don’t make the mistake of saving a few dollars for a mount as breakage will result in your expensive camera falling to the ground. These cameras aren’t repairable. If the camera breaks, you get to buy another. Moral of the story: buy a good mount. Stick with metal wherever possible. 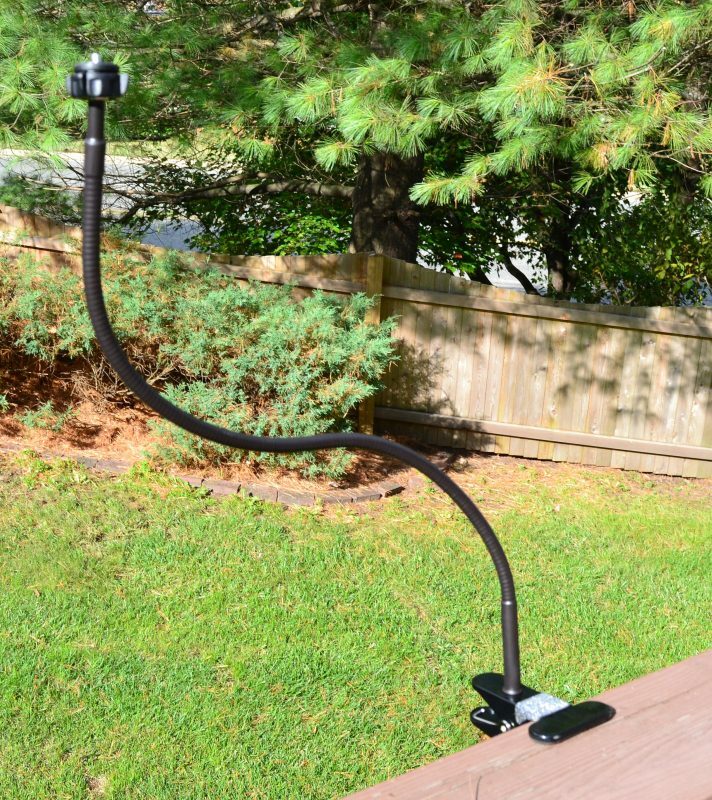 Since I have experience with the Arlo, I can also tell you to avoid the magnetic mount for outdoor use. I think magnetic mounts are terrific for indoor use. Not so much outside. A good wind will (and has) knocked my camera off the included dome mount that Arlo provides. Fortunately, many cameras that are made for outdoor use include a standard 1/4″ – 20 threaded mounting pattern on the bottom. This allows deployment of a wide variety of outdoor mounts that are made for security cameras. You will find this pattern in many of the home security cameras made to be used outdoors. You aren’t likely to find it on cameras made for indoor use. For example, the extremely popular Nest Cam (made for indoor use) does not have a standard tripod screw pattern. The Dropcessories Indoor/Outdoor Camera Mount is made of metal and plastic. This is the mount used when mounting on a flat surface in an upright position or on a wall. There is a swivel ball which allows a 360 degree camera maneuver and it will tilt 90 degrees. The mount has that standard 1/4″ – 20 threaded tripod screw that we just talked about. If you would like to mount your camera from a ceiling, the Arkon Camera Wall and Ceiling Mount is a fine choice. This mount is made of metal and is heavier duty than the prior selection. This mount has adjustment points at the base, midway and the tip. There are pre-drilled holes and screws for mounting on any flat surface. I like these the best for mounting your outdoor home security camera in an upside down position. But what if there aren’t any flat surfaces to mount your home security camera? That’s where the mount that’s in the photo that accompanies this article comes into play. The Tree Stand or Rail Hunting Bendy Mount for Cameras is typically used in outdoor situations for hunters but it can also be used for a lightweight home security camera. The base has a very tightly made clamp that opens to two-inches. There’s a 27 inch flexible arm that can be bent to get around objects. Like the other mounts, this also has the standard 1/4″ – 20 threaded base to fit the tripod screw at the bottom of the camera. These three outdoor home security camera mounts will get the job done when coupled with any camera that has the standard tripod screw pattern. Be sure to securely attach the mount before attaching the cameras and once adjusted to the right angle, try not to move it as it’s always painful to adjust it back to where it was previously.